In the light of Anthony Joshua’s comments regarding his ‘Stamina Problem’ stating that it’s a heavyweight problem not a Joshua problem – I’d like to respectfully disagree. Firstly, by way of a disclaimer, let me say I think Joshua is a tremendous athlete. After he won the Olympic title in 2012 he appeared on the British programme ‘Superstars’. I remember turning to my dad after watching him run the 100m and saying ‘this guy will win the heavyweight championship of the world’. Very few men can run the 100m in mid 11s, let alone those with incredibly long levers at a height of 6ft 6. It was obvious from that showing alone that he was incredibly explosive and in good all round condition. 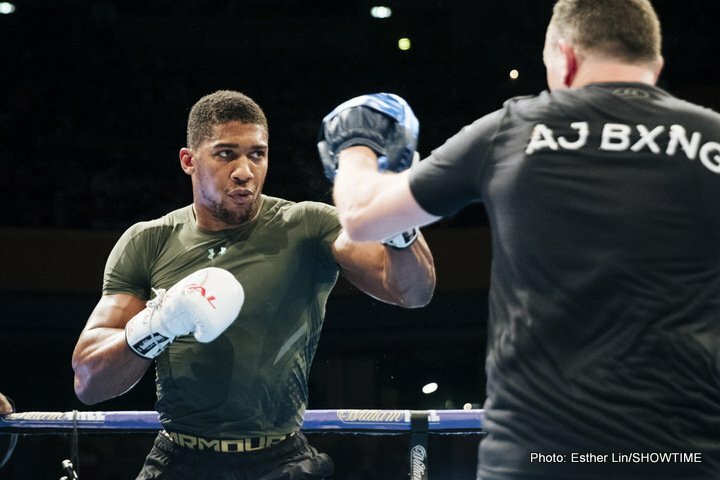 When you factor in that the heavyweight division has a recent history where there is a litany of out of condition participants (even some fighting at world level) and very few that could be considered elite athletes – Joshua was always going to be off to a good start. Boxing in general has suffered from archaic practices until fairly recently when it comes to the conditioning side of things. Repeatedly getting up at 4am to go on slow plods does not in any way imitate the demands of the sport. Yet, traditions die hard and even today many trainers will insist on the conditioning element of roadwork being a staple not an add on. Boxing is essentially a series of intermittent, short explosive bursts. In one way it suits Joshua’s natural conditioning skill set. When he explodes, he has the ability to finish things very early but the downside of the likes of Joshua (sprinter types) is that the explosivity takes a lot out of them. Think of them like Ferraris. They are fast but they run out of petrol very quickly. Sometimes diesels that start slower win the day because they just keep going. However, the notion that heavyweights can’t train their way into better conditioning is simply false. Since a championship fight is 36 minutes of interspersed explosive actions, the aerobic system also comes into play. A bout lasts far too long not to train the aerobic system too (roadwork type training). Obviously boxing is a multi faceted discipline. It’s not just down to conditioning. Someone like Bernard Hopkins was able to slow down proceedings sufficiently so that his aging frame could cope with more able, better conditioned athletes. His skillset, his technical ability undid the conditioning of younger athletes. By contrast, fighters like Joe Calzaghe or Aaron Pryor had natural levels of boxing conditioning that enabled them to go at such a pace that they were able to undo superior technicians. None of the aforementioned are heavyweights, of course. Let us look at all time great heavyweight Evander Holyfield. In his first cruiserweight title fight he very nearly got walked down and out worked by the aging warrior Dwight Muhammad Qawi. I’ve no doubt Holyfield trained hard for the fight. His youth and determination to win saw him over the line but it was a close call. Holyfield more than any other probably deserves the credit for dragging boxing training more into the modern age. In order to bulk up from cruiserweight to heavyweight, without losing excess speed, he hired a plethora of trainers and coaches from outside the traditional realm. The result was the best conditioned heavyweight we have probably ever seen. At a mere fifteen stone he fought ‘super-heavyweights’ considerably larger and was able to win through against the odds. In possibly the greatest heavyweight round ever, he was tagged early in round 10 by Riddick Bowe. Holyfield swayed and staggered and it seemed impossible that he would survive the round. Bowe continued to rain down fire and brimstone upon Holyfield but in a scenario which could perhaps best be described as a “lazarus moment’, Holyfield came back from the dead and finished the round on the ascendency. It was Bowe that returned to his corner on unsteady legs. Holyfield had apparently been training under a system designed by Fred Hatfield using what he called his ‘three minute drill’. It used a mixture of sprint drills and explosive jumps with slower aerobic moments that lasted about three minutes. I’ve tried it –it’s quite a session ! I wonder if Joshua is using it. If not, why not ? Joshua had been labelled a weightlifter by some of his detractors. This is a little unfair. He has put some of his training for all of us to see on youtube. He seems to be playing somewhat to his strengths. He is reinforcing his explosivity. His anaerobic system is great. But what about the aerobic side ? The more he bulks, the more he will struggle with this. An athlete needs to train his weaknesses more than his strengths and I’d question whether this is occurring. We saw in the Klitschko fight that he was gassed early. We then saw that he was only able to fight in short anaerobic bursts from the mid way on. The aging Klitshcko, always a clever strategist, had come in light clearly intending to exploit this weakness in his younger opponent. He nearly pulled it off. I’m not saying Joshua was lucky, he pulled it out of the bag when he was in a losing position. Yet, if Klitschko was five years younger it likely would have had a different conclusion. The heavyweight division is not exactly brimming with talent right now. There have been better eras. Joshua is the leading figure in my eyes. However, he is vulnerable and his ‘stamina problem’ is his major weakness. I don’t think he needs to fear Parker all that much but Wilder poses a different problem. Whilst Wilder still lives up to his name of being wild he can bang. He might only be fifteen stone, but crucially he is a good athlete. He’s explosive but he lasts the course well too and he takes his power into the later rounds. If Joshua doesn’t put Wilder away early (and I think he might) then his lack of aerobic conditioning could well become a determining factor. I’ve seen an image of Joshua tweeting a picture of himself and a Concept 2 with the label ‘pain’. Yes, but I’ll bet he didn’t do 12 x 3 minutes as aerobic conditioning (on the Concept 2) but instead did sprint bursts. I’ll bet he hasn’t done 12 x 3 minute ‘Evanders’ either. Joshua is very talented but I see him sleepwalking into a future defeat that could be readily avoided with more specific boxing training.